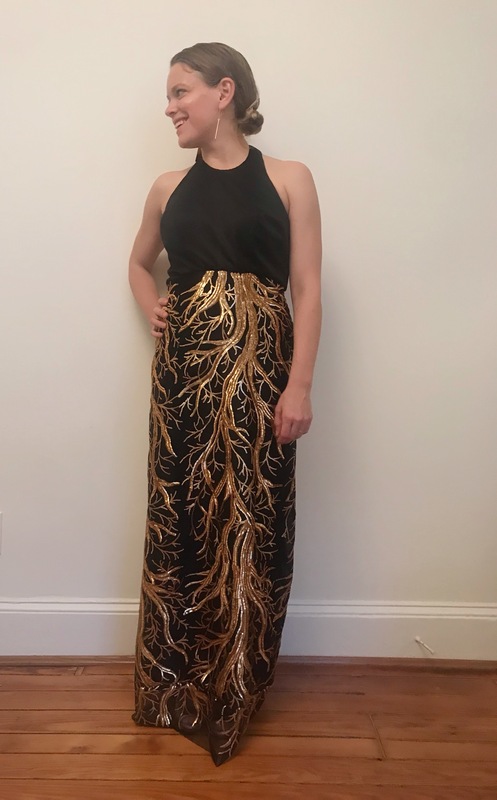 The Dress the Stash Built, PART II: Couture Sewing Techniques and sewing with sequins without losing your sanity. For the long-winded preamble on this dress that I love, including pattern adjustments, see here. 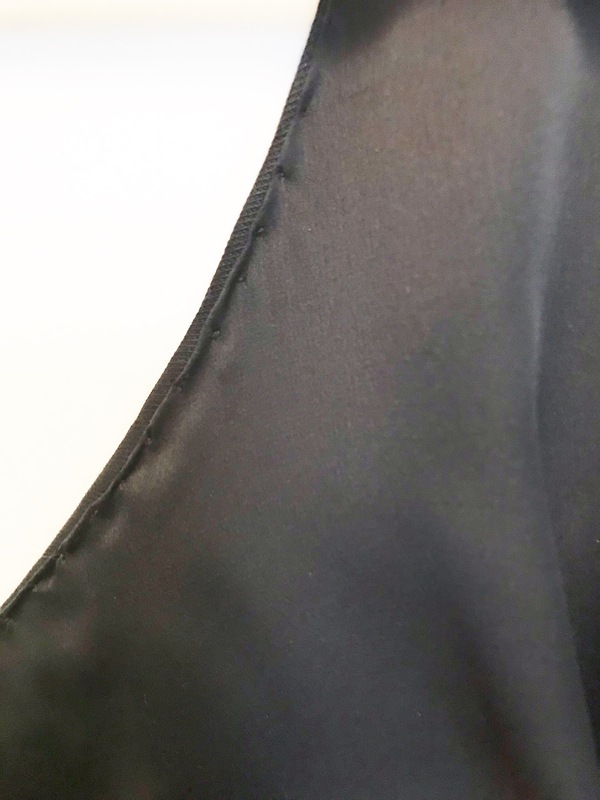 I wanted to get into some of the nitty gritty sewing details here, especially since I’m submitting this for the couture category in the Sew Frosting challenge that Kelli from True Bias and Heather from Closet Case Patterns are running. It’s TRUE. Four years of hobby sewing has made a big difference, and this project really showed it. Here are some of the techniques I used, and there are some resource recommendations at the bottom of the post. 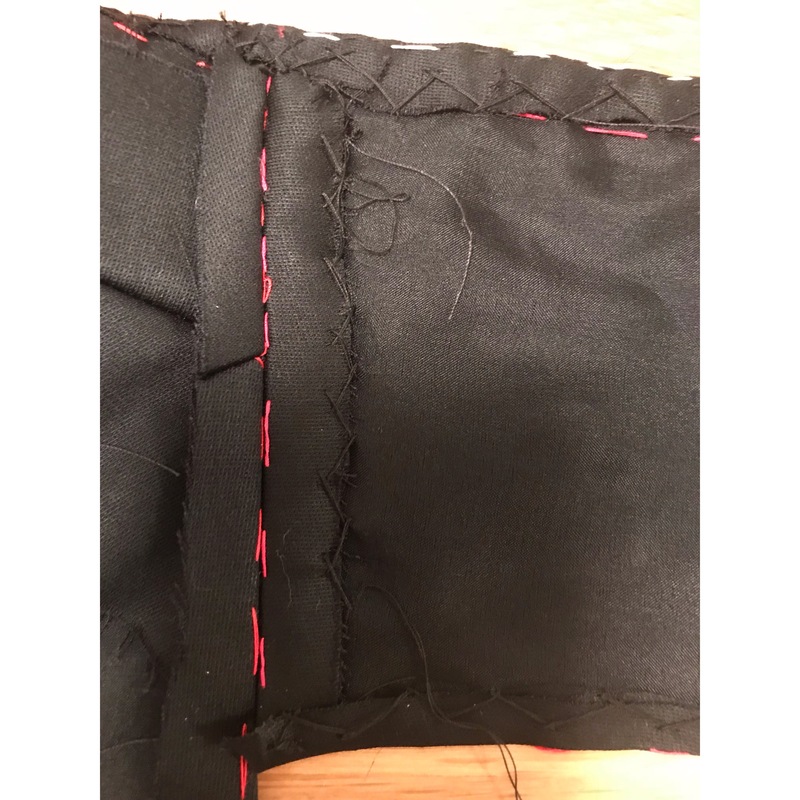 – Couture tells you to use very wide seam allowances in order to allow for any fitting changes that might be necessary in your final garment fabric. So you pin your seam-allowance-less pattern piece to the main fabric, thread trace your seam lines, and then cut very wide around the seam lines. This was very useful for me when I realized the back was quite low. I had a big enough seam allowance to raise it the half inch I needed to cover my bra band. Here you can see the new seam line (white thread), and the original pink seam line. All that extra got put to good use. – I underlined the bodice with silk organza. This gave it more structure, and it also allows you to conceal all manner of controlled hand-stitching. See next. – Once I was confident in the fit of the bodice, I clipped the seam allowances a bit, pressed them back, and catch-stitched them to the silk organza underlining. This keeps everything nice and smooth. Once everything was stitched down, I removed the basted seam line threads. – I used boning in the side seams and the back panel. 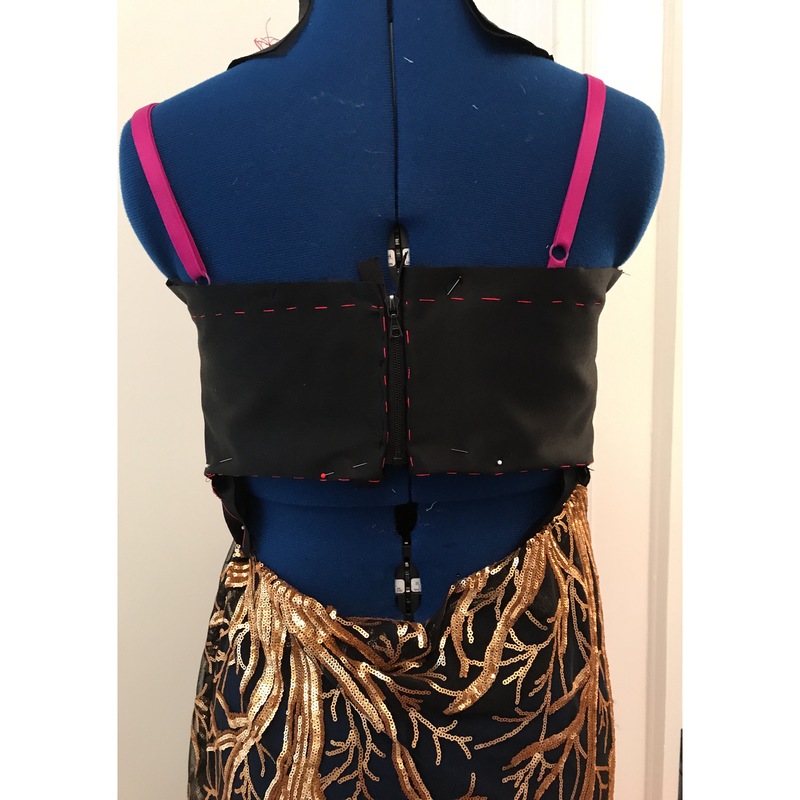 I didn’t have the time or patience to contemplate making a built-in corset, but boning takes some of the stress out of the bodice. I just harvested boning from some dead bras before throwing them out. The wide seam allowances helped here as well: I just concealed the boning inside them. That’s why the seam allowances look puffy in the above photo, and below you can see the boning peaking out — it’s red. Yes, I left the boning pieces in the encasing from said dead bras. 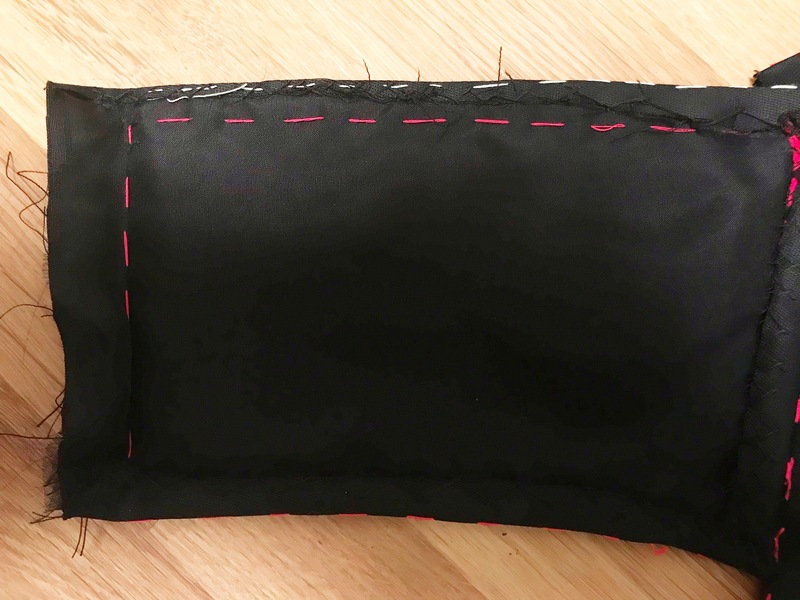 – I installed the lining by hand, using very small pick stitches. 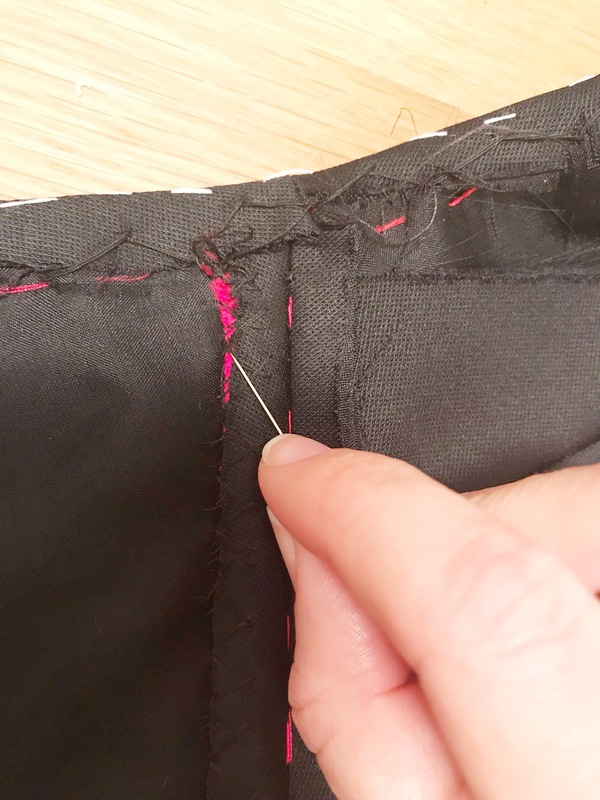 Again, this gives you a lot of control, and by pick stitching the lining, you ensure it doesn’t pop up over the edge of your garment fabric. This is dorky, but I love the way it looks. Here is an arty shot of the armhole. 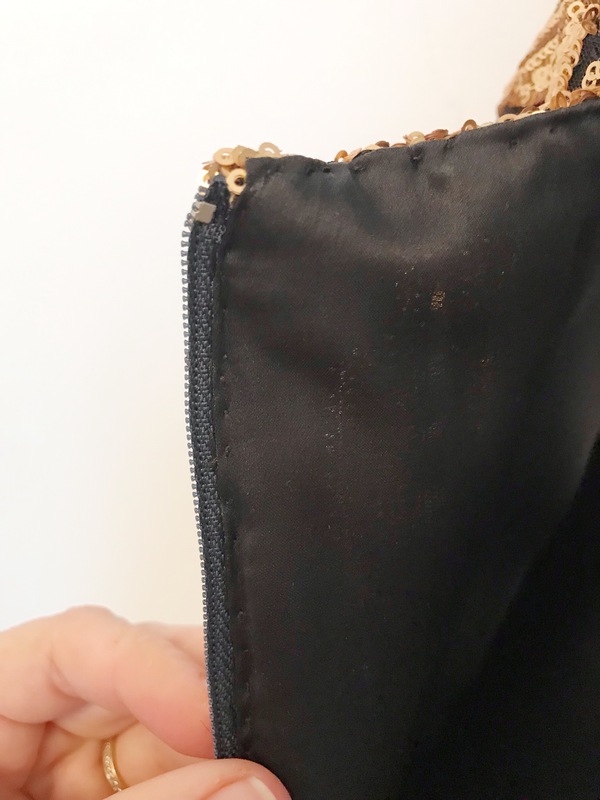 – I also hand installed the bodice zip using pick stitches. Again with the control. I also think the little stitches on the size of the zip are pretty. Same same the skirt zip, and I think it was maybe easier to do by hand than it would have been wrangling all those sequins under a machine. Basically every tutorial on the internet, even the one from beginner-friendly Tilly and the Buttons recommends removing the sequins from the seam allowance of the fabric so that you don’t sew over them or have sequins facing your skin. No thanks. Nevermind no thanks, how do you actually do that without ripping the mesh to pieces? Maybe this makes sense if you are using a heavily embroidered fabric with glass beads or something, but really these are just little plastic disks. I sewed right over those sequins and never looked back. I did spend some time tugging the pieces of sewn fabric apart at the seam to get some of the sequins caught in there to pop out, but that’s about it. 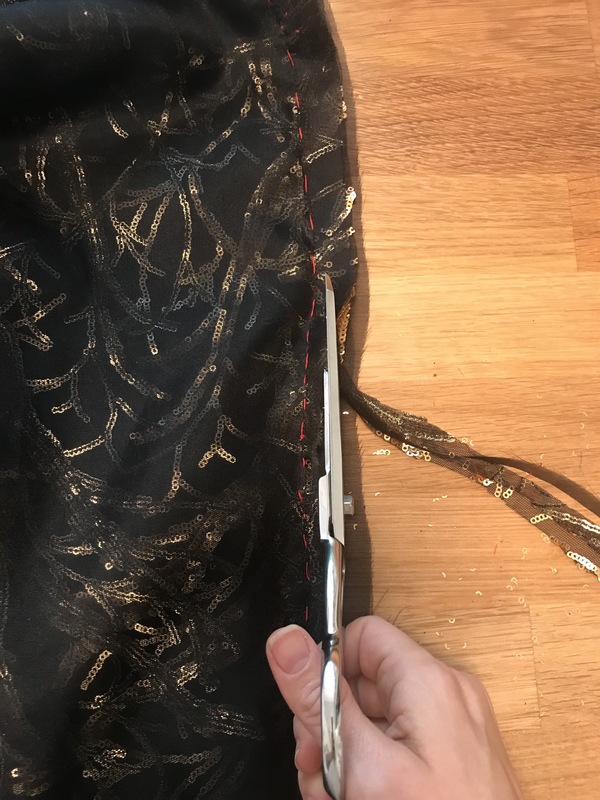 BUT BECAUSE THERE WOULD BE SEQUINS FACING THE LINING (in the seam allowance), I needed to seal up the edges of my lining fabric so that it wouldn’t fray quickly. That was easy, I just did french seams. I also tried a few ways of sealing up the edges of the sequined fabric. These aren’t really couture methods, but they did work. 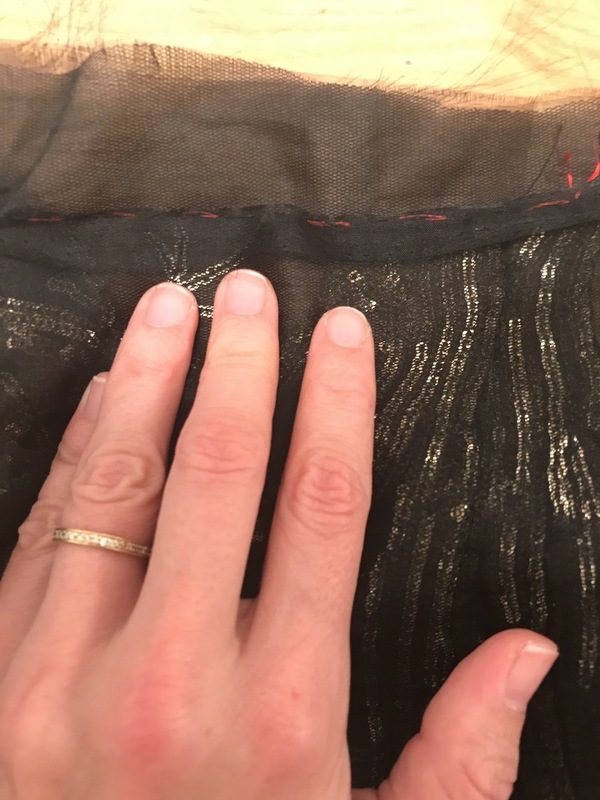 On one, I trimmed down the sequin fabric, and then wrapped the very wide seam allowance of the silk organza underlining around the edges (tucking the edges of the organza under), for a sort of Hong Kong seam effect. Hard to see here because it’s sheer black organza around sheer black mesh, but I tried. On the other, I ‘pressed’ (just with the warmth of my hands) the seam allowances of the sequin fabric to one side and trimmed. I then wrapped the silk organza underlining around and under the edges, and sewed down. This is sort of like a flat fell seam, but I was only sewing down onto the underlining, so you can’t see from the right side of the garment. Both methods worked just fine. I’d say I have a mild preference for the second, because you only have to sew once. It wasn’t all sunshine and couture rainbows, though, friends. The DAY BEFORE our black tie event, when I was finishing things up, I realized that the dress was NOT LONG ENOUGH FOR HEELS. How or when that oversight occurred, I have no idea. To fix, I cut a 6” wide panel of the sequin fabric and simply attached it to the bottom. That was the perfect solution, but it means this is not a perfect dress. You can see at the bottom the trees don’t lineup quite right. But what’s perfection anyway, amiright? A lot of these methods I picked up years ago when I took the time to follow this Susan Khalje Craftsy class. I know there’s something happening with Craftsy and Bluprint, but I hope this never goes away. It’s great. And then there’s Clare Schaeffer’s Couture Sewing Techniques book. It’s great as a way of flipping through to look for solutions to specific problems in the way that a video course is not necessarily. Love ALL of this. Great post. Love your sense of humor and writing style. 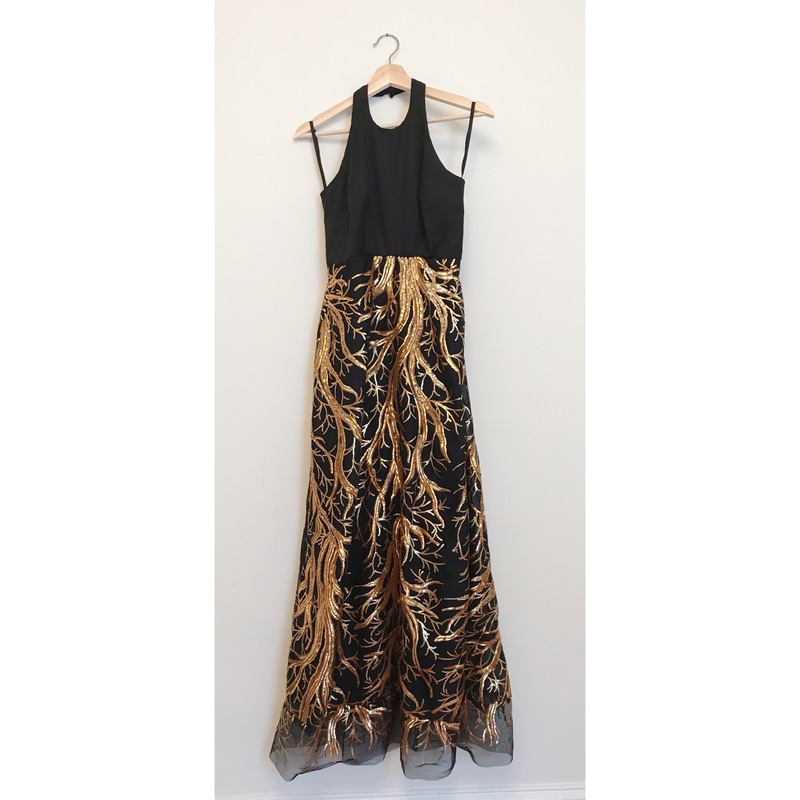 And this dress is fantastic. Congratulations. impressive work. Congratulations on tossing others’ recommendations and forging your own way! Gorgeous dress! Your pattern mashup resulted in the perfect style for highlighting the beautiful sequined fabric. H2T gorgeous!! (Kinda literally, when it comes to the fabric source!) It’s beautiful on you! The skirt fabric is just amazing and you really made it shine. (Oddly, I didn’t see branches at first; to me it looks like tributaries or the circulatory system.) And actually, I didn’t notice the bottom until you pointed it out, and I doubt most anyone else would either! Based on every photo I’d seen of the full length up to now, I thought you may have used horsehair in the hem since it has some nice volume to it so…no harm done, right?